I have an icing recipe that says cream butter and confection sugar together until creamy. Well, it never gets creamy it just looks like pellets (little white balls). What am I doing wrong? It sounds like your confection sugar aka powdered sugar is not mixing in well with the butter. I recommend first whipping the room temperature butter until light and fluffy(important to use soft butter for this. )Then sift the sugar through a fine mesh sifter to remove any lumps.Some brands are better than others. I recently tried to use the store brand and it was lumpy, Use Dominoes or another high quality brand of powdered sugar. Add the sugar a little bit at a time alternating with vanilla, lemon or almond extract. You can also add in a small amount of liquid, like milk or lemon juice, making sure they are also at room temperature. Once the sugar is mixed in you can whip up the butter at medium to high for a minute or so until you are satisfied with the taste and consistency. Here is the easy buttercream recipe from Dominoes. I personally don't use the amount of sugar that that recipe calls for. I use much less, to taste. There are alternate ways to sweeten buttercream icing. Try honey or maple syrup. Have you tried making Italian meringue buttercream? 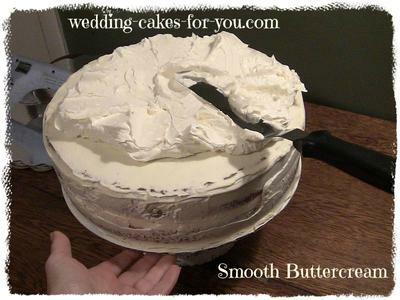 Here is the link to the wedding cake frosting recipe on this website which uses egg whites and a sugar syrup to lighten and sweeten. Another tip when making these recipes is to not whip the buttercream too much as it incorporates too much air, which will leave you with small pockets and holes on the sides of your cakes when icing. Use the flat beaters and don't over whip. Or use the wire whisk and don't over do. I have used both. Good luck with getting your buttercream creamy.